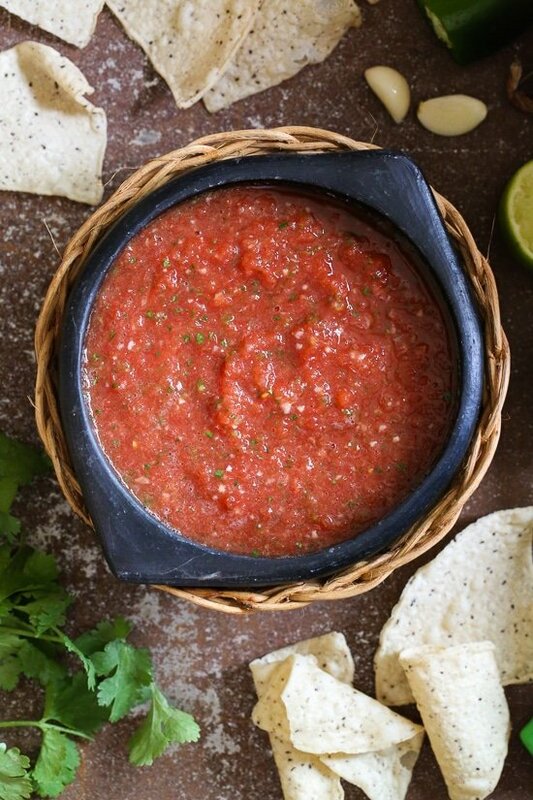 Get the chips ready for this quick and easy No-Cook Restaurant-Style Salsa recipe! In less than five minutes, you will have a delicious, healthy appetizer or snack everyone will love. It’s bright, fresh and perfect for parties! Other salsa recipes I love are Mango Avocado Salsa, Shrimp Salsa and Pico de Gallo Salsa. When I make pico de gallo I always use fresh tomatoes, but when I want a restaurant style salsa, I go with canned which is great as it’s available all year! This recipe is mild and kid-friendly, but if you like it spicy you can leave the seeds from the jalapeno or use serrano peppers for an even spicier salsa. I highly recommend a mini chopper or food processor, you want this chunky. 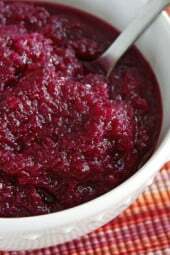 If you use a blender it will be pureed and the color will be dull. You can totally adjust this to your taste. If you like it garlicky you can add more garlic. If you’re eating low-carb, or Keto I love using cucumber slices in place of chips! For Whole30, make your own plantain chips or sweet potato skins for dippers. 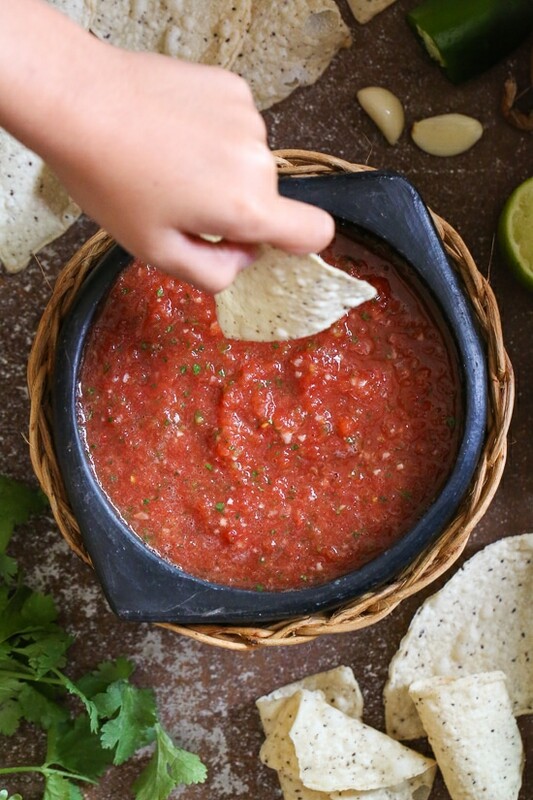 Get the chips ready for this quick and easy No-Cook Restaurant-Style Salsa recipe! In less than five minutes, you will have a delicious, healthy appetizer or snack everyone will love. It’s bright, fresh and perfect for parties! Place everything in the chopper of food processor and pulse a few times until combined and chunky. Don’t over process. what is the best way to “store” this if you want to make a large quantity? I am thinking of this summer and fall when I take care of my garden. I go through a lot of salsa. Is it better to can or freeze? Store it in a jar and keep it in the fridge. It will be good for 12-18 months if the lids are on well! Delicious! Quick and easy. So much better than from a jar. I did tweak it when I had nothing fresh in the house. I used dry minced onions, garlic powder, jarred jalapeños, dried cilantro, bottled lime juice. Still really good! I make mine with canned whole tokatoes plus a can of Rotel in the blender. By using whole canned tomatoes, it won’t be pureed. Also green onions, a whole jalepeño or a serrano chile (seeds removed), cilantro and salt. I have to keep friends supplied or they claim to have withdrawal symptoms! Oops! Fresh garlic and salt too! This has been a no hit in our house and delicious, refreshing summer treat. I did add about 1/4 cup of apple cider vinegar because we like it spicy and zesty. I love this recipe. It tastes just like the kind you get at a Mexican restaurant!? SO good! We are not fans of jalapeños so we just left that out and it was still amazing ! Hi Gina! 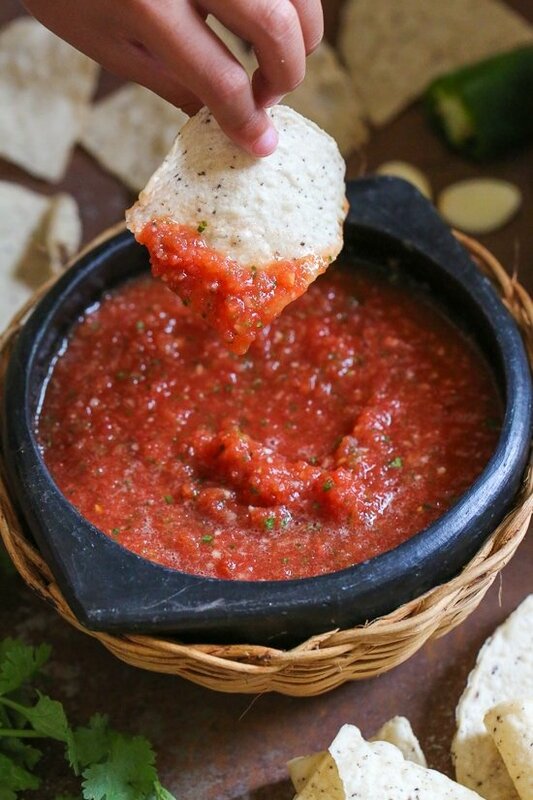 I love, love, love this salsa. I would like to make it a wee bit more “liquid-y” though. Any suggestions on what do add to make it more so? I tried a bit of tomato sauce last time but felt it wasn’t right even after adjusting with more garlic, lime and cilantro. I did try processing the tomatoes just by themselves but still not getting the desired texture. Thanks! are you using the juice from the tomatoes in the can? Delicious and gorgeous color. I added a touch of liquid stevia (sweet drops) to cut some of the acidity. We liked it. I think it needs more that 1/2 jalapeno. I also added a pinch or 2 of sugar and some Adobo seasoning. That was helpful. I will make it tomorrow. It is going to be enjoyed by me. Thank you. I will. Rate it even before tasting it. This was delicious and super easy. It really does taste like restaurant-style salsa. I added a bit of cumin and more salt than the recipe calls for. Yesterday I had it on turkey taco pasto, today in a salad, and tonight in my chili! I’m hoping to throw it on some eggs later this week. Sooooo good (I’m obviously addicted)! 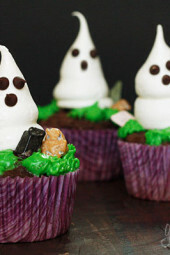 This is delicious and super easy to make! I used an entire jalapeno since we live spicy food…never buying the jarred salsa again! This recipe is amazing!! I have been making a lot of your recipes and I have not been disappointed, They are amazing and I love that everything is made with real food!! Thank you Gina!! Eating healthy can be difficult your recipes have made it so much easier to cook healthy, fun, delicious food!! This was perfect first time! Didn’t have to go back and add a pinch more anything. I used more jalApeno pepper to start with cause we like spicy. Thanks for another great recipe. Is this a whole 30 recipe? I don’t see how eating chips is part of the diet. The Salsa is Whole30, makes a great dressing for salads. The chips would not be, but you could always dip veggies in it. This was awesome! Tastes just like the homemade salsa I get from a local Mexican grocery, except a third of the cost. 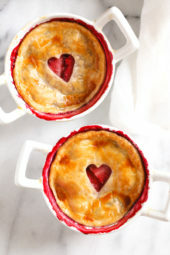 Thank you so much for sharing all your wonderful recipes with us! This looks fantastic. I’m wondering which tortilla chips you prefer to serve this with. I’m on a search for a tortilla chip that isn’t total junk food! I really like Siete chips. Made this yesterday and we love it. The taste is so fresh. I only have a blender so I blended it on low a couple of pulses and added chopped cilantro last. If I had a food processor I bet it would be better. I make a similar version but always use fire-roasted tomatoes for extra smoky flavor (either Muir Glen, Trader Joe’s [with green chilies] or if nothing else is available, Hunt’s). I also broil the onions, jalapeno and garlic first for more charred flavor. Sometimes I throw in a chipotle chili, some broiled tomatillos or roasted garlic – the possibilities are endless! We love salsa! We always make our own salsa! The only difference is ours has also a can of Rotel & a 1/4 t. cumin! We also put it into a blender & use the pulse so it is not pureed! I make it for our mission trips & our high school students love it! I do some with & without cilantro. One suggestion for this – add onion last. It can get frothy and gross if it’s too chopped in the processor. Throw the onion in last and pulse like once or twice after it’s done. My mom suggested this and the second batch was MUCH better. I may have just over processed the first time too. Who knows. Thanks for the simple recipe, perfecto! Yes I only press it like 4 to 5 times really quick. I make a similar on, but in case people want to experiment. I use green onion and we put in a small can of el pato , a spicy red sauce that is easy to get in CA. Either way you make it, this is . I don’t add lime, now I will since everything you make is good Gina. Ugh, my iPad being weird..either way you make it, this is delish, is what it was supposed to say. Can’t wait to try this. How long does a batch typically stay good? Can it be canned? Probably about 4 days. I don’t see why it couldn’t canned, though I have not personally tried it. What about freezing? Have you tried saving it that way? Oddly enough I’m the only salsa eater in my house and getting through an entire batch solo sounds really fun, but unlikely. I don’t think it would freeze but should be fine in the fridge a few days. I made this for Halloween last year and it was an absolute hit. I froze the leftovers (which wasn’t much) and have only just used it after 4 months. It was still amazing. Threw it in with some cooked green beans. So yum. This looks delicious. Are you able to use fresh tomatoes? We just have a lot from our last venture to the garden. If so about how many? I like to add a chipotle in adobo pepper plus some adobo sauce to my salsa. Gives it a nice smokey flavor!